What to Do in Birmingham in September 2018 | Infomedia, Inc. 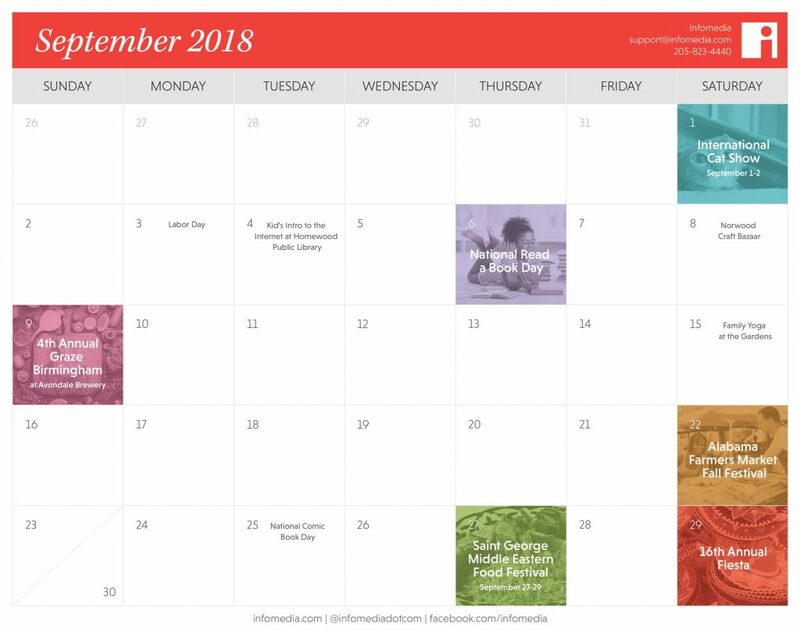 The weather is cooling down, pumpkin patches are springing up and Birmingham holds a wealth of events for the month of September. From Fall festivals to international cat shows, there’s an eclectic collection of activities happening in the city. Football games, hay rides, and autumn farmers’ markets are all things to look forward to in September. But never a city to go by the book, Birmingham has several unique events that are sure to keep your calendar full and your weekends busy. From watching felines compete in agility games at the International Cat Show to trying a new dish at the Middle Eastern Food Festival, there’s something going on for everyone. Keep track of these happenings with our free downloadable calendar. Plus, if you’re looking for ways to spruce up your business’s social media postings, feel free to use our calendar as inspiration. The International Cat Association proudly presents a weekend dedicated to felines. Visitors can enjoy watching cat judging, seeing agility trials, perusing pet products and even visiting with cats up for adoption. If you’re a crazy cat lady (or dude, we don’t judge) then you won’t want to miss it. Celebrate workers this Labor Day at one of the events happening in and around Birmingham. Visit Our Lady of Lourdes church for their 32nd Annual Labor Day Festival, featuring games, crafts and food. Or venture outside of the city limits and attend Tannehill Ironwork’s 27th Annual Labor Day Celebration and Moon Pie Eatin’ Contest, which offers a cash prize, live music and BBQ. Worried about introducing your kids to the world wide web? This free class at Homewood Public Library is an easy way to get started. It’s open to children in grades K-5th and covers topics like learning to browse the internet and safety measures. Take some time to enjoy your favorite paperback, anthology or even graphic novel on National Read a Book Day. You’ll have plenty of options if you visit any of Jefferson Country’s various libraries, or a local bookstore like The Alabama Booksmith or Jim Reed Books. Delve into the Norwood neighborhood to enjoy a family-friendly weekend event. The Bazaar will host artists and businesses offering crafts and handmade goods. When you’re finished shopping, take some time to stroll the area to enjoy beautiful architecture and the local community. Eat some of the best Birmingham has to offer at the 4th Annual Graze event. Local farmers and local restaurants, such as Tropicaleo and Magic City Sweet Ice, pair up to present delicious dishes to attendees. There will also be brews, live music and space for picnics. Tickets are priced on a sliding scale, so more of the community can come out and enjoy. Create a calm space in one of the city’s most beautiful places. The Birmingham Botanical Gardens is hosting family yoga that’s focused on strength and balance. This activity is suitable for the whole family, so children are welcome. Mark the changing of the seasons at Alabama Farmers Market’s Fall Festival. Free activities include hay rides, face painting, a petting zoo and more. While you’re there, don’t forget to check out some of the fresh local produce that is sold there year-round. Whether you’re a Marvel maven or a DC devotee, everyone who loves illustrated stories should be observing National Comic Book Day. Spend the afternoon reading new issues, tracking down collector’s copies or just visiting a local shop like Kingdom Comics or Sanctum Tattoos and Comics. One of Birmingham’s most beloved food festivals, Saint George Middle Eastern Food Festival is a cultural event that serves amazing meals. Try traditional dishes like kibbee or falafel, then after you’re full watch the Arabic dance performances and shop some of the specialty booths. The largest celebration of Hispanic heritage in Alabama, Fiesta is honoring its sweet 16 with the theme of “Celebrating in Full Color.” The day-long event will take place in Linn Park and boasts many family-friendly activities like live music, dancing, trivia and authentic Latin American food.